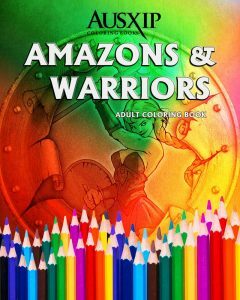 Amazons & Warriors Adult Coloring Book Volume 1 is a great way to relax and unwind. Inspired by the legendary fierce Greek Amazons and other female warriors throughout history. You will find 40 illustrations to color. Find a quiet spot, turn off the TV and your phone. This is your time and relaxing with this mix of female power and strength. Time to break out the pencils and start to relax and refresh ourselves by coloring. What Inspired You to Create Your Book? I love stories of strong and fierce female warriors and the Amazons were the epitome of the Warrior Women. From the stories come the art and this is what Amazons and Warriors is about. Free coloring design each month.